Features Magazine style design, 1 column main page, 3 columns footer page , elegant menu navigation horizontal drop-down, automatic read more with keep aspect ratio post thumbnails re-size, twitter share on homepage, Facebook likes on homepage, share button ready on post page , no image needed, best view on Mozilla, Chrome, Opera, IE 6,IE 7,IE 8 and IE 9, SEO friendly blogger title hack installed to help you rank higher in Google, and more. 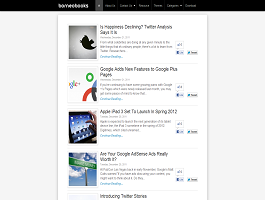 Borneo Books Blogger Template is another professional blogger template. This is premium template and categories with magazine style design, 1 column main page, 3 columns footer page , elegant menu navigation horizontal drop-down, automatic read more with keep aspect ratio post thumbnails re-size, twitter share on homepage, Facebook likes on homepage, share button ready on post page (with print, PDF online and send email button), no image needed, best view on Mozilla, Chrome, Opera, IE 6,IE 7,IE 8 and IE 9, SEO friendly blogger title hack installed to help you rank higher in Google, and more. First, you have to change template logo. Please use logo with black color background (#000000) with size 200px width and 50px height. Open your page element tab, and choose edit header. Do not forget to expand "instead of title and description", and upload your logo image from computer. Second, you have to change link URL on menu navigation horizontal drop down. Simple way, just open your edit HTML tab (No expand widget templates needed), and find code "menuwrapper" or "menubar". Change URL link and label name with your URL link and label name. Notes : Change "borneotemplates" with your twitter username. That's all. Hope you enjoyed with this new template and happy blogging.